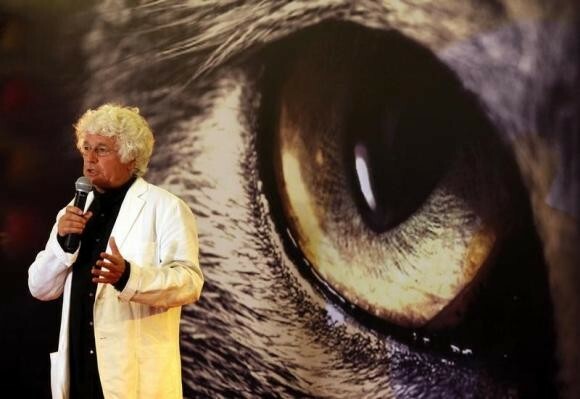 Director Jean-Jacques Annaud spoke in Beijing on Sunday in regard to his adaptation of the 2004 bestselling novel "Wolf Totem," written by Lu Jiamin under the pseudonym "Jiang Ron." Annaud said that he is not seeking to teach the Chinese "a lesson" and made the film that he wanted to make, without the interference of China's widely discussed censorship officials. After it was published, "Wolf Totem" received attention for its depiction of a narrative set during the Cultural Revolution, in which an urban student arrives in the Inner Mongolian steppes for re-education. After living among the nomad residents, his consciousness develops, especially in relation to the environment, and he becomes fascinated with the wolves in the area. However, all of the region's wolves are killed after a government order is handed down. "Wolf Totem's" approval by China's censors came as a surprise to many, as the author critiques Chinese culture and its political system. Lu was a veteran activist who was sentenced to death during the Cultural Revolution, but just managed to stay alive. He was later arrested for being involved in the 1989 pro-democracy protests in Tiananmen Square. The book won the first Man Asian Literary Prize in 2007 and Lu lives as a retired professor. This is not Annaud's first experience with China's authorities, as his 1997 film, "Seven Years in Tibet," upset the government at the time due to its portrayal of a young Dalai Lama. In 2015, China still considers the Tibetan spiritual leader as a political exile. The French filmmaker told reporters that he is aware that he might have been an exception in the realm of censorship, as the film is being promoted as an exemplar of Sino-French cultural relations.